Mee Mee Manual Breast Pump helps nursing mothers feed their baby in a lot of ease & convenience. It comes with a unique ?One Way Airflow' system that makes this pump the obvious choice for you. The soft textured silicone shield helps in stimulating the breast and protects air from entering inside that can contaminate the milk. The ?Squeeze & Hold? 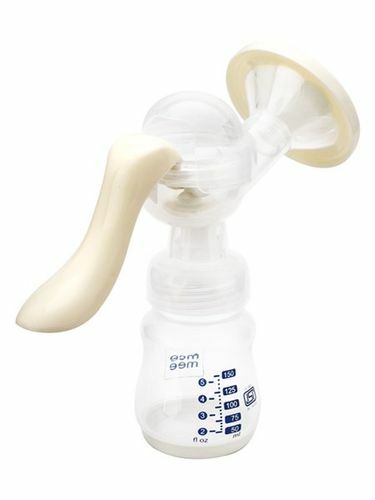 function makes pumping easy and natural as you can control the pumping rhythm. It is also clinically proven to give you maximum milk flow through its massaging action. Recommended by IMAPH and certified by BIS (Bureau of Indian Standards) and ISI, this pump is sure to make your journey into motherhood easier. Unique double valve design to allow repeated suction. Soft silicone cover protects breasts from redness & rashes. Works on a manual operation, you need to express milk by moving the handle on the funnel back & forth. All feeding accessories & parts related to this set are provided.